If you’re looking to help your children or students strengthen visual memory skills you probably already know that you’ll help them strengthen their reading skills in the process. Start with Part 1 of these cognitive quick tips or simply read on for some easy skill builders. So you’re driving in your car on the way to school, or soccer practice, or just running errands and you’ve already listened to your child’s favorite song ONE too many times. You feel a meltdown coming on, and it won’t be from your happy little angel in the back seat. One option: demand total silence. OR, consider this to be the perfect opportunity to get those young brain gears turning. Choose a nearby car’s license plate that is in your child’s line of sight. (If you’re doing this while driving, do be safe!) Depending on your child’s skill level, ask him to remember the first 3-7 numbers and letters he sees. Give him 3-7 seconds to “take a picture” of the digits. If you’d like, use the word “click” as a prompt for him to mentally imagine the license plate, turn away and tell you what he saw. Do your older kids need a bigger challenge? After you say “click,” have a distracting conversation with them before asking for the license plate digits. As always, remember the basic rule of thumb: most 5-year-olds should be able to recall up to 5 units of information, 6-year-olds, 6 units, 7-year-olds and up, 7 units. Start them BELOW their comfort level, then build up. When students return from recess, challenge them to recall the items. Note: writing the items down exercises a different visual memory pathway than repeating the items out loud. Feel free to alternate and keep the kids guessing. This is a great way to reinforce sight words or to integrate visual memory into a thematic unit. Before You Go can easily be turned into an auditory memory game as well. Simply TELL your students what you want them to remember before they go, then ask them to either repeat the items out loud or write the items down when they return. 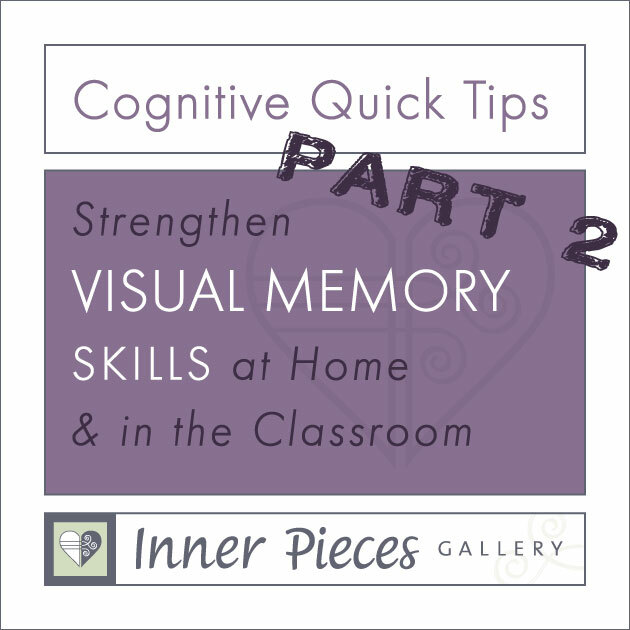 Cognitive Quick Tips: Auditory Memory at Home & in the Classroom.